I was in Edinburgh this week, where the cycle campaign Spokes has just reported that there are more cyclists and fewer drivers in the city than ever. 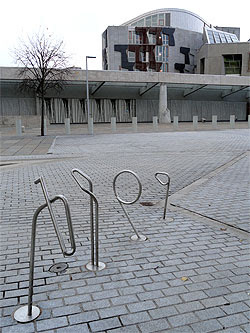 It was hard for me to tell - I was too busy negotiating the tram-disaster roadworks in Princes St - but I was intrigued by these cycle racks. 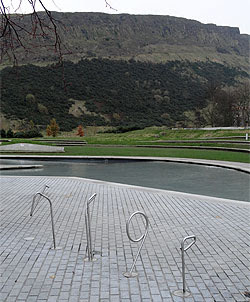 They're splendidly situated in front of Arthur's Seat, which used to be a volcano; perhaps Arthur was too fond of the curried haggis. The view the other way is the equally splendid Scottish Parliament building. There I passed a happy hour spectating the Health and Sport Committee taking evidence on the Welfare Reform Bill legislative consent memorandum LCM(S4)5.1. 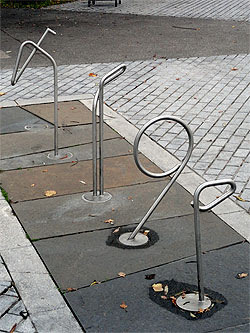 But the most distinctive thing is the shape of cycle racks, which have a touch of the Miró about them. 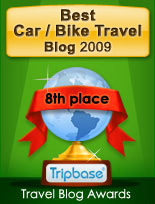 I wasn't quite sure how to lock my bike to any of them, to be honest. Perhaps the absent-minded twisting of a few paper clips, during a particularly dull meeting of the Health and Sport Committee, was mistaken for maquettes of the new facility? It all suddenly makes sense! I am enlightened... many thanks. But hang on... I'm on my stomach now on the floor... nope, it's not working. There's only one wheel. Because there are only four stands, not five! 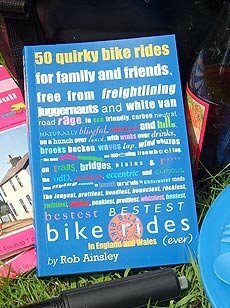 So it's a nice idea but, er, one wheel short of a bicycle. Still, it suggests all sorts of possibilities for similar perspective tricks. Particularly with rude shapes. Each rack looks like it has its own solution, so users of the rack will have to learn and remember four different techniques -and the cost of getting it wrong will be a new bicycle. This is just daft. Sheffield racks may not look pretty, but they are designed to keep your bicycle there. Man and van... and bike?